JaguarPC Review 2019: Is JaguarPC a Good Hosting? Since 1998, JaguarPC has been the hosting vendor of choice for many business in the United States. The company has over time extended their wings to the United Kingdom and several other countries. JaguarPC is one of the most affordable web hosting vendors in the United States. For two decades, JaguarPC has been a premier web hosting vendor in the United States. In fact, the company has consistently appeared in the ranking lists of the world’s best web hosting vendors since they started their operations in 1998. This U.S.-based hosting provider also has a significant presence in the U.K., Brazil, Canada, India, and Malaysia. They serve hundreds of thousands of customers in the public and private sector out of their offices in North America and the United Kingdom. At the moment, their website and service is available only in English. Daily backups – JaguarPC presents themselves as the go-to hosting brand to keep your organization’s mission-critical information safe. They carry out daily backups to help you get access to your website back even after an attack or in the event of a disaster. 100% uptime and network guarantee – With many years of experience in the field, JaguarPC has all the necessary tools to ensure 100% uptime for every website they host. They market themselves as the leading vendor to turn towards when in need of unmatched reliability and 100% network connectivity. Free domain transfer – JaguarPC conducts website migrations from your former hosting provider at zero cost. The process is smooth and efficient, so you’ll have minimal downtime. BoldGrid website builder – This drag-and-drop builder is included with every shared hosting plan and enables you to create a WordPress website in mere minutes. Staging environments – This is a rarely found feature that allows you to test out the look and feel of your website before it goes live. 450+ pre-installed applications – To make the website creation process straightforward, JaguarPC has included hundreds of free third-party applications that you can use to increase the functionality of your website. Free Let’s Encrypt SSL certificates – This is a must-have in today’s SEO landscape, so it’s fortunate that JaguarPC has included this as part of their packages. All in all, I found JaguarPC’s packages amazingly feature-rich and reliable. They’ve also recently expanded their network infrastructure to include the United Kingdom, though at this point they only offer shared hosting, reseller hosting, and management services out of this new data center. Unfortunately, they don’t have any data centers in continents besides North America and Europe at the moment. As one of the world’s most reputable web hosting vendors, JaguarPC’s hosting solutions are not as expensive as you would initially expect. In fact, perhaps because of how big the company has become, they’ve been able to reduce their hosting subscription costs significantly, making them one of the most affordable vendors in the United States. It’s been 20 years since they launched their operations, yet they’re still one of the fastest growing hosting vendors in the United States. JaguarPC has no free trials or a free version of any of their web hosting plans. Instead, they have a money-back guarantee to serve as an assurance of quality to their customer base. JaguarPC’s technical support team is made up of hosting experts with many years of experience. You can reach this team via live chat on the JaguarPC website, phone, or email. The company’s support for their customers has for many years been the biggest reason many people have chosen this vendor for all their hosting needs. However, JaguarPC’s ticketing system has in recent years been marred with challenges and unending customer complaints. I opened several tickets over a one-week period and none of them were responded to within that week. That said, when I called their telephone support hotline, it didn’t take long to get connected to someone from their support staff. The conversation was pleasant and most of my queries were addressed. JaguarPC is the go-to web hosting vendor for any business owner who wants a mix of experience and outstanding hosting solutions. The fact that JaguarPC is still one of the fastest growing hosting solutions provider in the U.S. is a clear testament to their excellent hosting for businesses of all sizes. 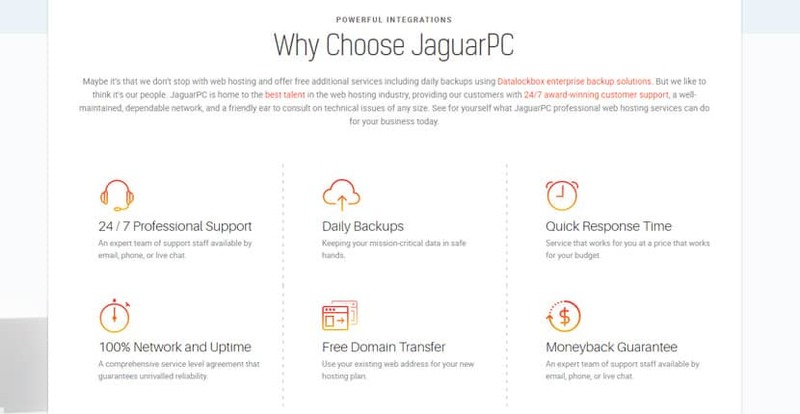 Wondering how JaguarPC stacks up against other Web Hosting companies? Enter any other Web Hosting company and we will give you a side-by-side comparison.